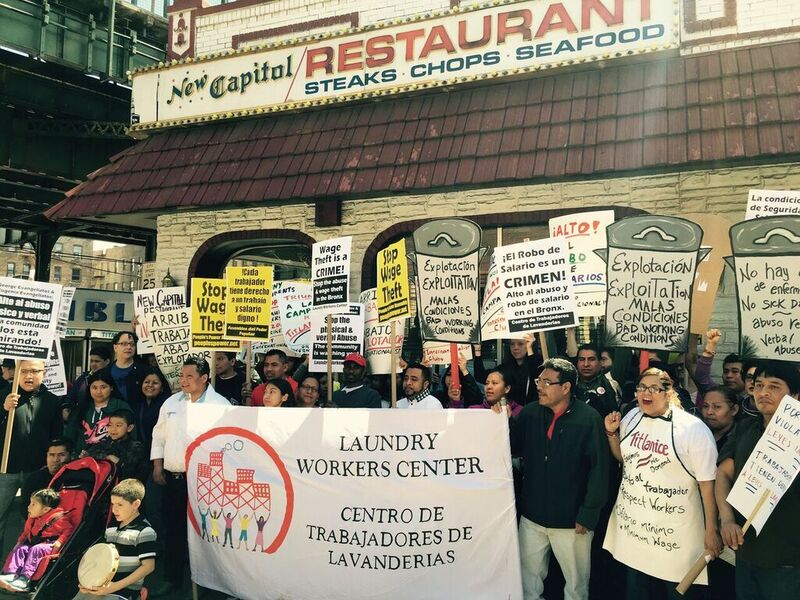 Bronx, NY--Today, workers at New Capitol Restaurant in the Bronx went public with their campaign to end wage theft, verbal and physical abuse, and dangerous conditions in their workplace. Surrounded by a crowd of 100 community supporters, New Capitol worker Teofilo Ríos delivered a letter to restaurant management demanding an end to unfair and unsafe conditions. 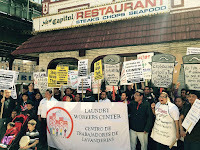 Before today, workers at New Capitol trained in private for six months with Laundry Workers Center, a grassroots worker group with an impressive track record of victories, most recently at B&H Photo. New Capitol workers say they were inspired by LWC’s win last fall at Liberato Restaurant, also located off Jerome Ave.
Oscar Ramires, another New Capitol employee, used to work at Liberato. “During the Liberato campaign, I learned that we cannot be afraid. When bosses break the law we must organize,” he said. Many of the workers demanding change at New Capitol were hired as dishwashers, but also clean the restaurant, prep the food, and do deliveries. They put in as many as 56 hours a day and are not paid minimum wage. They also face dangerous safety conditions, including broken, slippery floors, and unprotected stairs. Throughout the Republican primary debates, all candidates have vociferously called for more border enforcement. Donald Trump famously proposes the construction of a 2,000-mile border wall and to make Mexicans pay for it. This inflamed rhetoric is odd given the fact that undocumented Mexican migration, on a net basis, ended in 2008 and has been zero or negative for the past eight years. Although other Latin Americans continued to arrive at the border in small numbers, the volume isn't enough to yield a positive inflow of people. The Clintons have championed "get tough" policies that have bolstered those who have a financial incentive to maintain the status quo. It has been 10 years since the immigration marches of 2006 began when activists marched against a proposed federal crackdown on immigration. In spring 2006, a bill passed the U.S. House of Representatives that would make it a felony to be in the United States without documentation; ultimately this bill did not become a law. Instead of advancing a progressive and humane agenda on immigration, both Hillary and Bill Clinton have failed the Latino community on immigration reform. Kimberly finally released! And #StopTheRaids work continues! After more than 10 weeks of detention, an immigration judge finally granted Kimberly her freedom. Kimberly has been separated from her Atlanta family and friends since January 27, when ICE arrested her in a raid on her way to school. Despite multiple appeals for Prosecutorial Discretion – and more than *25,000 signatures* on the petition for her release – ICE never did the right thing. Even after the immigration judge granted her stay of deportation, even after the immigration judge reopened her case because she never had a chance to present her asylum claim, and even after the judge gave Kimberly a $1,500 bond—the lowest amount that can be set—ICE refused release, saying they wanted to appeal the order! Now, finally, Kimberly is free to pursue her asylum claim. Thank you to all of the thousands of people who have shown their support for Kimberly and called on President Obama to #StopTheRaids. Your voices hold this administration – and future administrations – accountable. And you helped Kimberly to keep going. You gave her and her family hope. There is still so much more work to be done. The Administration continues to use these aggressive enforcement tactics that spread fear throughout communities and target those fleeing horrific violence in their home countries. Its treatment of Kimberly is just one glaring example. *Keep up the fight to #StopTheRaids. * And know that your support matters. Assist advocacy by sharing stories of new raids in your community using AILA’sonline monitoring tool. To take further action, reach out to your members of Congress and to the White House through AILA’s Take Action to #StopTheRaids link. Artists set out to "erase" the border fence dividing the U.S. and Mexico by painting it a sky blue. 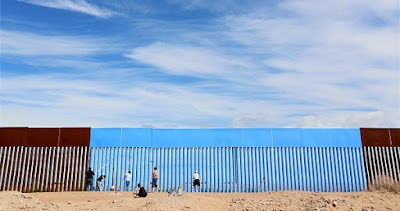 Artist Ana Teresa Fernandez and members of the cultural organization Border/Arte painted a segment of the border fence separating Mexico and the United States Saturday, in an attempt to make it disappear. Berry Farmworkers Toil 12 Hours A Day For $6. Now They’re Demanding A Raise. Some of the farmworkers who make it possible for U.S. consumers to have berries for breakfast are paid about $6 a day. Those farmworkers include children toiling for 12 hours a day at 85 percent the amount of money that adults get paid. Many farmworkers do not get lunch and rest breaks and are subjected to terrible housing conditions. Hoping to rectify these issues, farmworkers in the United States and in Mexico have been on a three-year-long fight to get Driscolls — the world’s largest berry distributor — to recognize their unions so that they could have better working and living conditions. And now they’ve taken their complaints on the road in a month-long protest tour along the west coast. On April 24, 2013, some 1,134 people died in the collapse of the Rana Plaza complex outside Dhaka, the capital of Bangladesh. The building housed factories where low-wage workers, largely women, stitched garments for the U.S. and European markets. For several years before the disaster a number of U.S. opinion makers -- notably New York Times columnists Thomas Friedman and Nicholas Kristof -- had been arguing that assembly plants like those at Rana Plaza were crucial to the development of economies in the Global South and therefore a boon to the world's most impoverished. The media's efforts to promote sweatshops suddenly slowed down after the collapse in Bangladesh, but they seem to be reviving now, just as we approach the third anniversary of the disaster.